"This whole universe, with all its vastness, grandeur and beauty, is nothing but sheer imagination." Back in 1991—which, to my internal chronometer, feels like five or six years ago, not twenty—Marvel Comics put out a trade paperback called The Very Best of Marvel Comics. (It’s out of print, but you can still find copies here .) Writers, artists and editors were asked to list their all-time favorite Marvel stories and the winners were collected together, with introductions written by a small group of creators—myself included. I was cleaning up my office the other day and pulled The Very Best of Marvel off the shelf, paging through the stories and re-reading the introductions and end-notes I wrote for two of my all-time favorite comic book classics: “This Man, This Monster” from Fantastic Four #51 and the two-part “End of the Green Goblin” from Amazing Spider-Man #39 and 40. Those introductions got me thinking that it would be fun to periodically look back on my most beloved comics stories here at Creation Point, starting, of course, with the aforementioned F.F. and Spidey classics, then moving on to others that imprinted on my heart and imagination in the years before I became a comics professional. With that in mind, I’ll run these two short appreciations today...and return for more in a month or so. Enjoy! 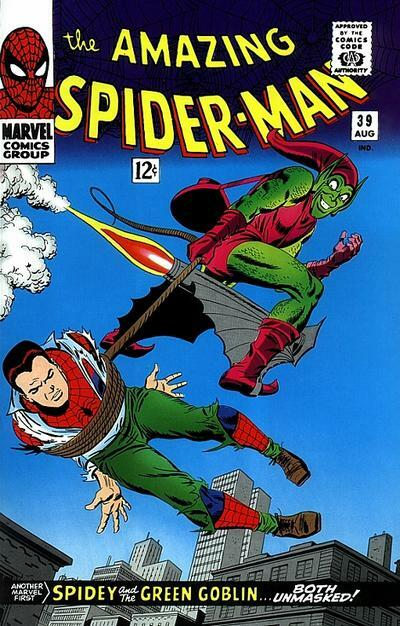 What I remember most vividly is the cover: the Green Goblin gliding through the sky with a bound and defeated Peter Parker—his Spider-Man costume visible beneath his street clothes—in tow. To my twelve year old eyes—conditioned as they were to the neat and tidy DC Comics of the era—this was mesmerizing: a villain who’d actually unmasked the hero! A hero so utterly helpless! As with all great comic book covers, this one fired my imagination. I didn’t even have to read the story: that one picture alone suggested dozens of wonderful tales. And the truth is I didn’t read the story—not then. I didn’t become a regular Spider-Man reader until the following month, with the story’s concluding chapter in issue #40: it didn’t disappoint me; in fact it exceeded all my expectations (as did the preceding issue, which I tracked down at a local used book store. There weren’t such things as comics shops in those ancient days). The writing, the art...even the sound effects...were wildly different from what I was used to in the pages of Superman, Batman and—my favorite of the day—Justice League. I think it’s impossible for a young comic book reader today to conceive of just how different the Marvels of the sixties were from everything that had come before. I’m older now, more than a bit jaded when it comes to funnybooks; but when I look back at Spidey’s desperate fight to the finish with the original Green Goblin, I can feel that twelve year old coming alive inside me. He’s there right now, standing, wide-eyed, in front of the comics rack in a Brooklyn candy store. And he can’t take his eyes off that cover. Hyperbolic opinion time: Marvel’s greatest achievement of the sixties was undoubtedly The Fantastic Four. Amazing Spider-Man may have been more popular, the “Doctor Strange” feature in Strange Tales may have been more mind-blowing, but the F.F.—well, they were the cutting edge of mainstream super-hero comics. The energy, the emotion, the dialogue that managed to move effortlessly from celestial pomposity to zany wisecracks, the artwork that was (and, for my money, still is) the very best the genre had ever seen: Lee and Kirby were at the peak of their craft—creating serialized extravaganzas, entertainments that were thoughtful, funny and just plain fun; equally accessible to children and adults. The splash page said it all, quite eloquently: no heroes and villains duking it out, not a word of dialogue—just the Thing, standing silent in the rain, lonely and vulnerable. 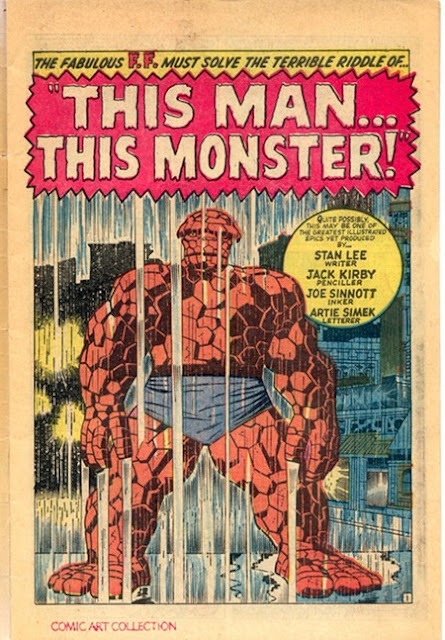 That melancholic feeling permeated the entire story, which was as much about the unnamed villain of the piece as it was about Ben Grimm; for, in becoming the Thing, in becoming a monster, what that nameless scientist learned was how to be a man. Looking back from the vantage point of today’s so-called sophisticated comics, it all seems a little trite, a little corny. But there’s an emotional chord that all the best stories strike, a chord that keeps vibrating every time we go back to them: a chord of genuine emotion and emotional truth. “This Man, This Monster” struck that chord. And, to its eternal credit, still does. Given the madness and violence that erupted in Tucson a little over a week ago, how fitting—and how necessary—that today Americans take a collective breath and celebrate the life of a man who was dedicated to peace. Martin Luther King didn’t just talk about pacifism, he lived the ideal in a profound, and practical, way—and gave his life for it. There’s no shortage of people who’ll tell you why war is terrible but necessary, why violence is tragic but often justified, why the dream of a peaceful world has to remain a dream. For one day, at least, let’s not listen to them. 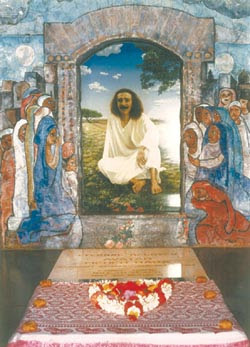 Let’s believe, with every fiber of our being, that war is never necessary, that violence is never justified, and that peace is a dream that can, that must, be manifested. And let’s remember a dreamer who showed us the way.